CheapOair, the top flights-focused hybrid online travel agency, announced today the top ten destinations its consumers are traveling to on Memorial Day weekend. 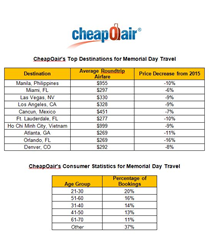 After a long winter season, CheapOair’s data shows that a majority of travelers are taking advantage of the low airfares available to welcome the summer season over the long holiday weekend. "Memorial Day Weekend begins the peak season for warm-weather travel. Airlines are adding capacity to some very exciting destinations across the US including Las Vegas, Nevada, Hawaii and Florida. Additionally, with the extreme decrease in airfare costs over the past year, more consumers are able to afford travel to the destinations of their choice, whether it be domestic or international, ” mentions Spagnola.